The intense media hype around the troubled Obamacare roll-out threatens to obscure the real issue at hand: how to go beyond the piecemeal Affordable Care Act (ACA) and build a truly universal health care system that provides equal, high-quality care to everyone. While many on both the left and right predicted -- albeit for different reasons -- Obamacare's problems, it would be a mistake to get distracted by what are largely stopgap measures to curb the excesses of the current market-based system. Instead, it is time for constructive new initiatives that steer the current energy around health care reform toward the goal of guaranteeing the right to health care for all. Despite the paranoid visions of conspiracy theorists like Rush Limbaugh, there is little chance that universal, publicly financed health care will simply emerge automatically from the imaginary Trojan horse of the Affordable Care Act. In reality, the only thing inevitable about Obamacare is the political wrangling that obfuscates the true challenge ahead. Yet below the radar of the Beltway and media, promising initiatives are surfacing. The best hope for truly universal health care comes from the small state of Vermont, which is on the road to establishing a single-payer-style, publicly financed health care system, after passing the country's first universal health care law in 2011. The innovative people's movement instrumental to achieving this breakthrough has now inspired Healthcare Is a Human Right campaigns in other states across the country. While keeping their eyes on the prize of universal health care, these campaigns are carefully navigating the challenges and opportunities of ACA reforms. Clearly, Obamacare's problems cannot simply be ignored or belittled. The list of everything that's wrong with the ACA has grown so long that the media are struggling to keep up. In addition to the high-profile embarrassment of the flawed marketplace website, which triggered a postponement of the online small business exchange and may well delay the enforcement of the controversial individual mandate to buy insurance (following the already delayed employer mandate), the president's decision to allow skimpy insurance policies to be reinstated is likely to compound problems in the future. As insurance companies -- ever vigilant about their bottom lines -- were quick to point out, if younger and healthier people can keep their skimpy coverage outside the exchange, profit-seeking insurers may use "market pressures" as an excuse for raising premiums on people inside the exchange. Moreover, for every person who can "keep their coverage if they like it," there will be many more who won't be able to keep their doctor or hospital, however much they like them. As insurance companies further restrict their networks, cutting even big hospitals out of their policies, the false "choices" offered in a market-based system that treats patients as consumers become abundantly clear: Consumers can choose their coverage, but they can't choose their care. Furthermore, whether they'll be able to use their coverage to actually see a doctor -- any doctor -- depends on the amount of disposable income a person has at hand to satisfy their plan's high deductibles and co-pays. Such cost calculations will increasingly affect not only those in the exchange marketplace, but also those covered by ever-shrinking employer group plans. Employers are set to use Obamacare's "marketplace" emphasis as an excuse for further stratifying their group plans, pushing workers into a privatized shopping mall of highly tiered insurance options within their -- presumably non-unionized -- workplace. While all of this is bad news for anyone seeking access to care through coverage via the exchange or their employer, what about the 31 million people projected to remain entirely without insurance? The ACA was never designed to provide universal coverage, yet the number of excluded people has increased considerably since the Supreme Court gutted the ACA and made the expansion of Medicaid a state choice. In a reform predicated on channeling more publicly subsidized "consumers" to private insurance companies, it was primarily the expansion of the public Medicaid program that promised to make the health care system more universal and equitable. Yet about half the states have opted out, and these are precisely the states in which an expansion is most needed: states with extremely limited Medicaid eligibility, high rates of uninsured people, high levels of poverty, low wages, and skeletal public services. In these states, the ACA is about to leave a gaping hole of 8 million people who will be excluded from both Medicaid and public subsidies in the exchange (which are not available to those below poverty level). At the same time, the ACA will reduce support for public and charity hospitals based on a projected decrease in the number of uninsured people, leaving millions of people with literally nowhere to go for needed care. This exclusion from health care will have a disproportionate racial impact, as nearly six in 10 uninsured African Americans eligible for an expanded Medicaid program live in the opt-out states. Such clear failures to meet the basic human rights principles of universality and equity put the frenzied focus on Obamacare's website delays into perspective. The ACA, even once fully operational, will have tiers and gaps in its coverage system that segregate lower-income people from the wealthy, and people of color from white people. The ACA's differential impact on poor and rich, and people of color and whites, has entered the public debate perversely through right-wing pundits railing against any potential redistributional effects of a universal health care system that shares risks, costs, and benefits among everyone. Yet the ACA offers no such system; on the contrary, it is precisely the focus on means-tested subsidies in the exchange, and means-tested eligibility for Medicaid, that precludes the unifying appeal a universal program would have. Unless reforms treat health care as a human right and provide it as a public good for all, the politics of competitive individualism, persistent structural racism and decades of warfare against the poor are likely to draw resentment of any public program, even when poor people and people of color have very little to gain. Advocates for universal, publicly financed health care have long criticized the ACA's approach of using means-tested public subsidies to prop up private insurers. It seems nonsensical to transfer more public money into the coffers of private corporations, thus solidifying the market-based insurance system, when it is this very system that has failed to ensure access to care for all and causes the U.S. to lag behind in key international health indicators. Yet while a single-payer alternative can marshal most evidence in its support, single payer advocacy has made little progress over the past few decades. Political change is not a matter of having the better argument; it requires building enough people power to overcome the very real ideological and financial power embedded in the existing system. A universal health care community that is divided into ACA supporters and single payer advocates is unlikely to achieve this. Vermont's Healthcare Is a Human Right campaign, led by the Vermont Workers' Center, has begun to change all this. By building a broad-based people's movement for human rights, the campaign became a strong and unified force with the power to change what was considered politically possible. 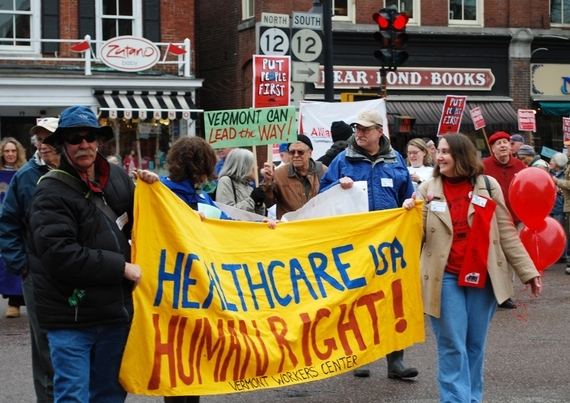 By focusing on people and their human right to health care, grounded in basic principles rather than technical policy prescriptions, the campaign was able to set the state on a path toward a universal, equitable system that will provide health care as a public good to every Vermont resident. Since 2011, this breakthrough has catalyzed similar campaigns for the human right to health care across the country. Inspired by Vermont's human rights organizing model, groups in Maine, Maryland, and Pennsylvania studied the lessons learned, picked up the torch and started developing innovative campaigns in their own states. Together with related campaigns on the West Coast, they seek to pave the way for a domino effect of state-based universal health care wins. The Healthcare Is a Human Right campaigns build on ACA efforts and draw on single payer arguments where they can, yet their focus is on organizing people to stand up for their rights and demand a truly universal and equitable health care system. On Human Rights Day, December 10th, these campaigns will come together in New York City to discuss and celebrate progress made toward their shared vision. For this one evening, at least, the world will not turn around Obamacare.